Ride the G: to Southport Station. Catch Muncie Girls, Ben David and The Lazy Susans when they play Vinnies Dive in Southport on Saturday February 16. 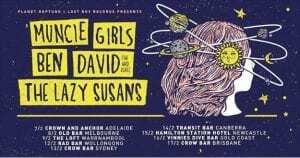 Muncie Girls have announced its much anticipated return to Australia in February 2019, following the recent release of its critically-acclaimed second album ‘Fixed Ideals’. Continuing their friendship, Muncie Girls are joined by The Hard Aches frontman Ben David as well as being joined by rising local stars The Lazy Susans.